Naval Historical Center #NH 63433. Cropped by author. Time-fuzed HE and incendiary shrapnel rounds were also available. The San Shiki Model 3 was a specialized antiaircraft shrapnel round of little effectiveness. 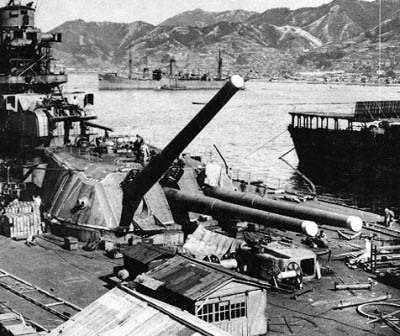 The Japanese 18"/45 gun was the largest gun ever mounted on a warship and was used only on the Yamato-class battleships. The triple 18" gun turrets on the Yamato weighted over 2500 tons apiece, as much as a large destroyer. The Kashino was commissioned specifically to transport this heavy weapon and its turrets from foundry to shipyard. The true caliber of the gun was disguised by referring to it as the 40cm (16") Type 94, and Allied intelligence did not get any idea of its real capability until two captured Japanese sailors revealed its characteristics under interrogation. As a result, the Yamatos were still listed as having 16" guns in Allied intelligence publications as late as December 1944. The gun was the ultimate embodiment of the Japanese Navy philosophy of shūchū dai enkyori shakegi ("very long range, concentrated fire"). However, while unquestionably a very powerful weapon, its ballistic performance was unremarkable for its size and its rate of fire was very low. The unusual wire-wrapped construction meant that the liners could be replaced only if the worn inner "A" tube was completely bored out. Willmott (1983) has concluded that the 18" had no advantage over the U.S. 16" that could justify the enormous expense of its development. The San Shiki Model 3 was a specialized antiaircraft round resembling a giant shotgun round. It was a weapon of last resort because of its potential for bore damage. It was also almost completely ineffective, inflicting no known casualties on Allied aircraft in the two engagements in which it was used (Battle of the Sibuyan Sea and Battle of Okinawa).